Please let us know if you can help fill in any gaps on this page. 1932: UCLA students John Biby, Bill Cooper and Richard Moore win gold medals at the Olympics in Los Angeles as crew on Owen Churchill’s eight-meter Angelita. Biby and Moore sail with Churchill on Angelita again over fifty years later, restored to serve as flagship for the 1984 Los Angeles Olympics. 1932: Antonia Churchill competes in eight-meter class in 1936 Olympics. 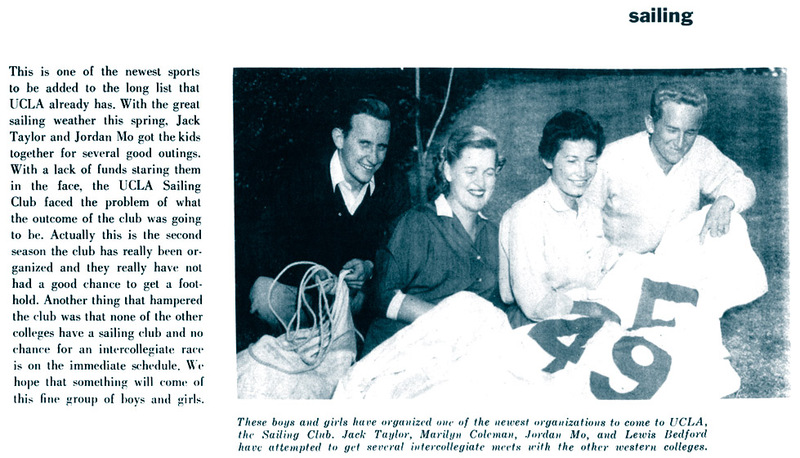 1945: UCLA Sailing Club established. 1954: Lewis Bedford wins B Division at college nationals; UCLA places 3rd overall. c. 1955: UCLA faces lack of funds and lack of local competition. 1957: UCLA places fifth at “the collegiate championships” (may have been a west coast event). c. 1967: Marina Aquatic Center is built. 1977: UCLA wins PCCs; Mark Rastello selected as All American. 1978: UCLA wins PCCs and national college championship (Henry A. Morss Trophy); Rastello and Allan Jewett selected as All Americans. 1979: UCLA wins overall and both divisions at PCCs; Phil Ramming selected as All American. 1983: UCLA fields a Transpac entry. c. 1990: Boat falls off trailer on I-5 unnoticed, never recovered. 1999: Gwen Garnett selected as All-PCIYRA women’s skipper; Kevin Richards selected as All-PCIYRA coed skipper and wins district sportsmanship award. 2000: Richards and Garnett again selected for All-PCIYRA teams. 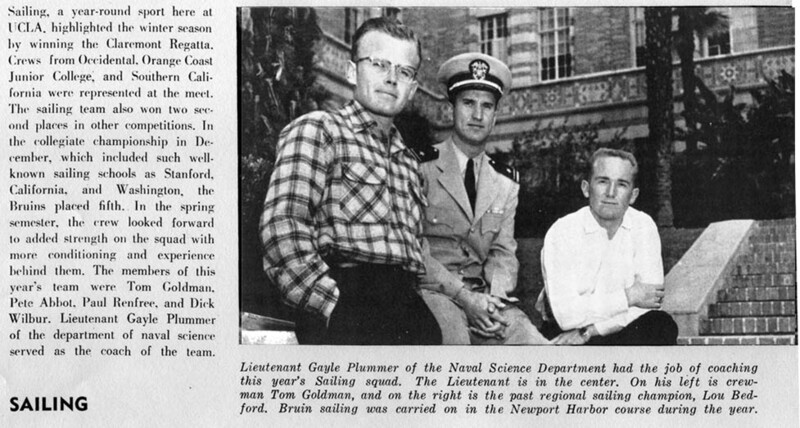 2001: UCLA named as up-and-coming program by Sailing World magazine. 2004: Events commemorated by the annual Wheel Party transpire. 2005: Major expansion of team; many current traditions begin. 2008: First UCLA entry in the Course Croisiere EDHEC international regatta in France. 2009: FOUST established; first iteration of annual alumni regatta in its current form. 2011: UCLA wins A Division at PCCs and qualifies for national semifinals; three Bruins selected for All-PCCSC teams. While we get together our own history of the team, please check out the UCLA Marina Aquatic Center’s History of UCLA Sailing (note: page is archived and not fully functional).